Regardless of the industry you work in, it's essential that you ensure your clients are satisfied. While this is easy to say, in practice, it can be tough to accurately measure satisfaction. SmileBack has set out to help you measure and track satisfaction. In fact, earlier this summer we launched our CSAT measurement system into beta testing. Thanks to the enthusiastic support and feedback from partners who tested the tool, we're now ready to officially release it to the entire ConnectWise community. Pricing for SmileBack at just $69 per month. SmileBack helps you to easily measure client satisfaction via your ConnectWise service tickets. 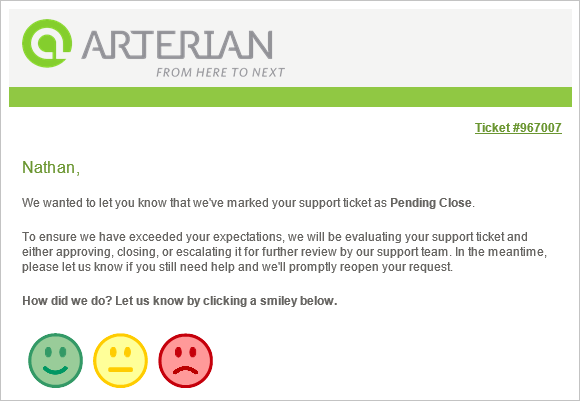 Clients are asked to select their level of satisfaction with your service by clicking on one of three faces. They're also able to leave an optional comment on your service. This information is then immediately recorded and made available in SmileBack and also posted to the internal analysis notes of the ticket. In-depth results table includes the contact and company name, ticket number, service ticket summary description, assigned resources, service board, client reaction, and any comments the client may have left as part of his or her response. Track individual engineer performance using the list of assigned resources. Automatically push reactions and comments back into ConnectWise as an internal analysis note on each service ticket in ConnectWise. User friendly dashboard and metrics are presented in SmileBack's familiar user friendly design. Real-time updates help you stay on top of issues as they emerge in real-time. Easily export data as either CSV or PDF for further analysis. Interested in learning more? Please visit our website or schedule a live demo today.